Welcome to BoxHaven, an artisan furniture company. Find imaginative chests, boxes, and wall furniture with designs inspired by nature. Each BoxHaven piece is individually crafted using the finest woods and traditional methods of joinery. 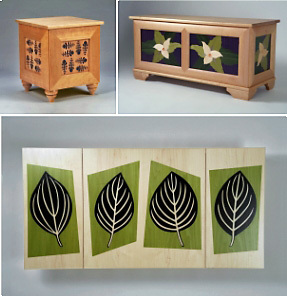 Artwork on BoxHaven furniture is produced in wood with a technique called marquetry, where cut veneers are pieced together by hand to create singular imagery. In addition to original furniture pieces, we offer artists and designers the tools to explore marquetry in your own work.